I am never happy with the end of summer. It truly is far too short and the loss of amazing produce is a heart break. So it’s time to bust out the autumn ingredients, and this pasta is comforting and delicious. If you can get your hands on in-season, fresh walnuts, even better. The best quality walnuts makes a big difference to the final product. 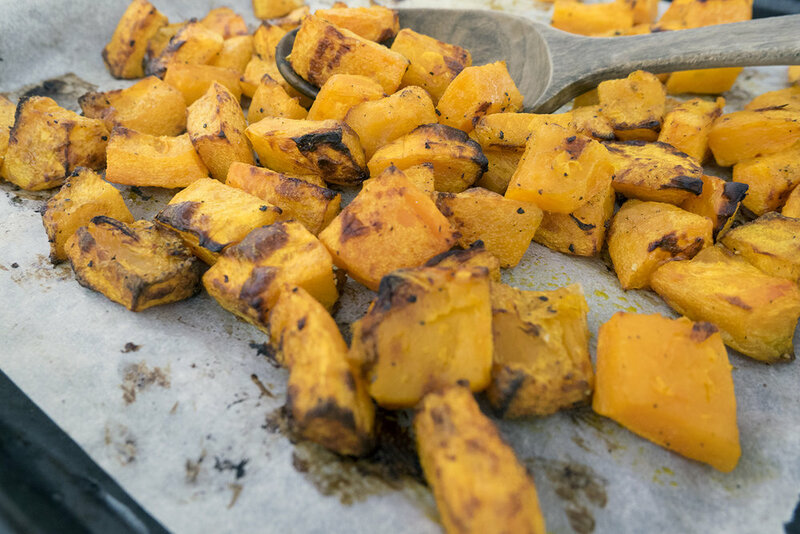 Toss cubed squash in 1-2 tbsp of olive oil and season with salt and pepper. Bake in a hot oven (225º C / 425º F) for about 40-50 minutes, until the squash is fork tender and gets nicely caramelized. Cook pasta until al dente. Reserve 1/2 cup cooking liquid. Heat 2 tbsp of olive oil in a sauté pan over medium heat. Gently cook garlic and fresh chilli for 1 minute. Add a splash of white wine and cook until reduced. Add squash into the pan with chilli and garlic. Add drained pasta with a bit of cooking liquids and toss. Add arugula and walnuts and toss. Season to taste with salt and pepper, and lemon juice. Serve with a generous topping of grated parmesan.